Josh's interest in photography began six years ago with a cheap camera and an open mind. After his first photos were published three years ago, the hobby became a full-blown obsession and career path. Combined with a talent for writing, the 26 year old has since had hundreds of photos and dozens of articles published in magazines including THE SURFERS PATH, THE SURFERS JOURNAL, SURFER, TRANSWORLD, WATER, and LONGBOARD. One year after graduating from U.C. 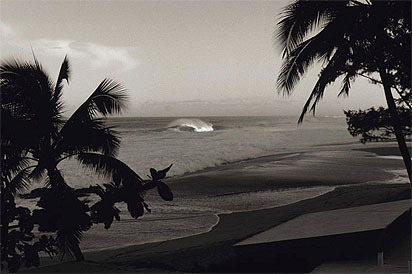 Santa Barbara in 2002, Kimball landed an internship in the photo and editorial departments of SURFER magazine, where he regularly interacted with many of the finest lensmen and writers in the business. Around this time, Josh began to develop his unique photography style, focusing on many of the more overlooked facets of ocean and coastal photography. While boasting a full arsenal of gear primarily for shooting surf-action, Josh's favorite subjects to shoot are empty waves and classic lineups.